Tumiki Fighters is a side scrolling action game where the player pilots a highly manoeuvrable plane around the screen while shooting at other aircraft. The display resolution is low, the graphics are simple, the controls are just the arrow keys and a firing button. I almost passed on trying this game, but then one interesting feature caught my eye: armour. In Tumiki Fighters when we shoot down an enemy aircraft the foe doesn’t blow up, instead it fades and falls off the screen. If we manage to dive down and catch the falling foe before it disappears we pick up the vanquished enemy and attach the damaged ship to our hull. We then benefit from having an extra plate of armour and, possibly, additional weapons. Put another way, enemy aircraft act sort of like Lego bricks and when we defeat them we can pick them up and attach them to our own aircraft, making us stronger. The concept works pretty well and seems to be self balancing. Adding more pieces to our own craft makes us harder to kill, but also makes us a bigger target. Since a single hit from an enemy ship can knock off a piece of our newly gained armour, the protection we build up disappears fast. 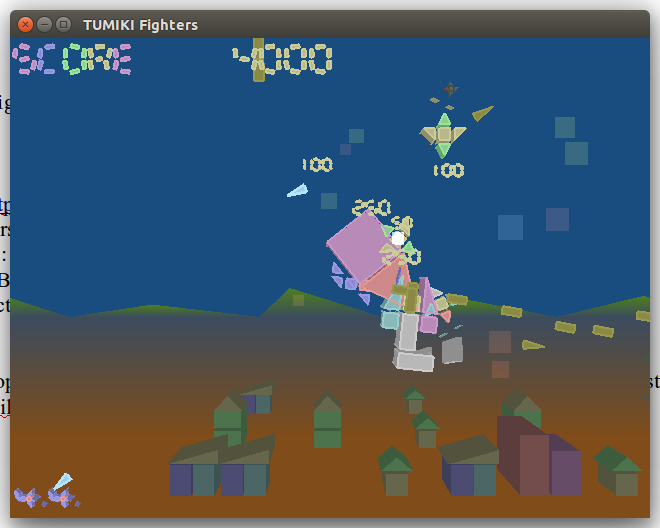 Tumiki Fighters is a high paced game and quite unforgiving of mistakes. I found most games I played only lasted a few minutes and involved me picking up and losing armour plating at a rapid rate. The game play, artwork and controls are quite simple, but also smooth. The pace of the game makes for intense, rapid-fire action. There isn’t much strategy to be had, nor is there a lot of manoeuvring room. This game might not hold one’s attention for long, but the concept of using enemies as Lego-like armour is a good one and the concept itself makes this game worth trying.